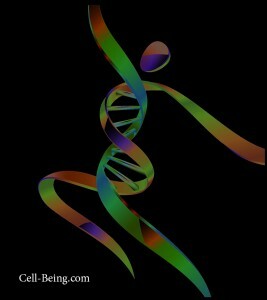 Exercise is Medicine – Definitely the Best Tasting! Exercise is medicine with no bad side effects, No insurance copay, No expensive equipment, no worries about drug interactions…..we are born with the only equipment we need – our body with moving parts – or rather parts that are supposed to move. We are also born with all the motivation we need to move – just watch the anticipation in a baby trying to wildly writhe & wiggle day and night. Problem is, the fascination with sedentary body rot ( usually from watching parents or being planted in front of a television or computer for entertainment) so intimately a part of our obesogenic society, our innate energetic enthusiasm, is extinguished. 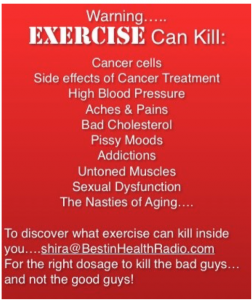 Exercise is the one and only prescription with no bad side effects. There is no drug that can lay that claim. However, we seem to want to pop a magic pill to exonerate us from any other onus. There is no pill, that can possibly provide the universal health benefits, protect us from aging, there is no competition to the healing powers of exercise. But yes, motivation is required. And I will add, as always, “no time” is a whine. Maybe there is no time for the gym, but I assure you there is time for physical activity. Perhaps no Eureka moment yet, but it is there. And with increased motivation, its amazing the time that is there. All of these create a toxic biological terrain creating the perfect storm for chronic illness. we have the potential to strongly influence our destiny. More motivation? The fitness faithful of wildly successful people: AKA – need something done give it to a busy person. Yes – exercise increases circulation to the brain – more brain power, focus, concentration – but I also know its about that life saving skill called time management – we are in control of our time – we are not being led around in robomode stressed about a lack of productivity, complaining we have no time. Carpe diem….Carpe the moment. Integrating concerted efforts of physical activity through out the day – is personal control and command of our behaviour – which is definitely a modern “naturally selected” survival trait. And yes, there is a prescription for exercise. Yes, physical activity, get moving, get our steps….all very important. However, to maximize the potential benefits of exercise, there is an accurate dosage and choice of exercise, just as any prescription. But keep it moving. The M in Move, is for Motivation. The E in Exercise is for Effort – physical & psychological effort.